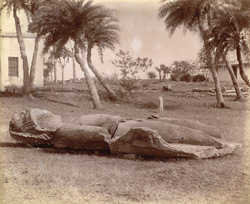 Photograph of the statue lying prostrate near the Mosque of Abu Nasir Khan at Jajpur in the Cuttack District of Orissa, taken by William Henry Cornish c.1870. Theodor Bloch states, in his List of Photographic Negatives in the Indian Museum, that the statue in the open field near the mosque "looks like an image of Avolokiteshvara." (a Bodhisattva). The List of Ancient Monuments in Bengal (1896), pp. 472-473, describes the mosque, which adjoins the Subdivisional Officer's compound, as being "about 70 feet long by 80 broad. It has four minarets on the east face; those in the centre small; the two at the outside large...On the roof are three domes, the largest being in the centre and measuring about 80 feet in circumference at the springing of the arch. These domes are mere coverings to three flat groined domes, which form the roof of the interior...there are three Gothic doorways on the east face. Over the centre one is a Persian inscription."